Put your creativity into motion as you master fundamental animation principles while learning vector art design, digital animation techniques and how to animate your own creations. This camp provides an introduction to animation, walk cycles, and storytelling techniques. No prior experience is necessary. All skill levels are welcome. 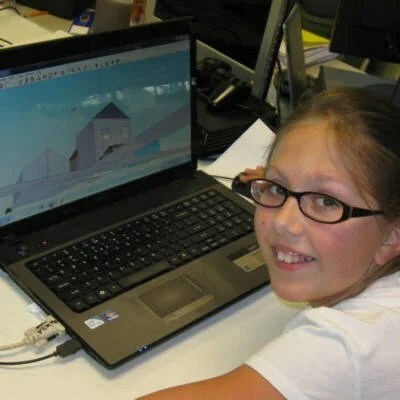 Fleming Tech Camps focus on providing campers with experiences working with amazing technologies. We provide Introduction, Intermediate and Advanced materials - we have your camper covered no matter your skill level. Many of our campers elect to take our camp programs more then once. Each time they take a camp program they have new experiences with the topics covered and can work on more and more advanced projects as their skill levels increase. Our camps are designed for kids that are highly motivated to learn about technology - about 65% of the day take place in a classroom. The day is broken up into six periods (not including lunch), and we offer a free extended AM and PM program at both the Cabrini University and Manor College Campuses. In addition, at Cabrini College, we offer an optional overnight program for campers aged 9 and up. More then 65% of the day is spent indoors working in the labs. Each day camper are provided with two AM and two PM instruction/lab periods. Each day our campers spend time outdoors (weather permitting) and play games such as capture the flag, kickball, 'Nurf War', and compete in water fights. We will take a few breaks during the camp day - during breaks campers can have a snack and/or play in a video or board game tournament. We feature daily game competitions with Nintendo's SUPER SMASH BROTHERS and Ubisoft's JUST DANCE. Many campers buy lunch from our partner schools. Each campuses offers an optional food service program and costs for the service differ from campus to campus. If you don't want to buy lunch, be sure to send a lunch with your child that doesn't need to be refrigerated. It's time to wake up - Mornings are awesome at Fleming Tech Camps! Camp doesn't have to end at 4PM! - Afternoons at Fleming Tech Camps are like a big party! The Extended Afternoon is full of fun and cool activities. Taking place in our gaming classroom, our campers have access to lots of games (board games and video games), experiments, craft projects and other activities. Your kids will have the option to: participate in a game tournaments, work on projects; join a quest in a role playing game; or just hang out!!! Are you interested in hosting a Fleming Tech Camp at your camp, university, business office, school or museum? We are interested in talking to you – contact us at: 484-222-0094.